The best EASY Oven Baked Chicken Breasts with the best chicken marinade is the perfect simple dinner recipe. Cook once and eat chicken recipes all week! Eating right and meal planning is always a goal of mine. I’m incredibly horrible at it because, after cooking/baking all day for this blog, I’m exhausted. If dinner that day isn’t one of the recipes I made, then it’s way too easy for me to default to take-out or frozen dinners. That’s why, on Sundays, we always try and meal prep protein for the week. We started doing this last year when my husband was doing Atkins. Every Sunday he would grill chicken breasts, skirt steak and some turkey sausages so that he had proteins for lunch all week long. I’d also use some of them in dinners (make it once, eat it twice). At the end of a long day it’s much easier to deal with already cooked chicken breasts than starting from scratch. In summer, we grill everything. Even though we live in California, where grilling weather lasts March through October, sometimes it’s rainy or cold or dark and we just don’t feel like firing up the BBQ. That’s when these oven baked chicken breasts come in handy. It’s always so hard for me to cook chicken just perfectly so that it’s moist and tender but cooked all the way through. 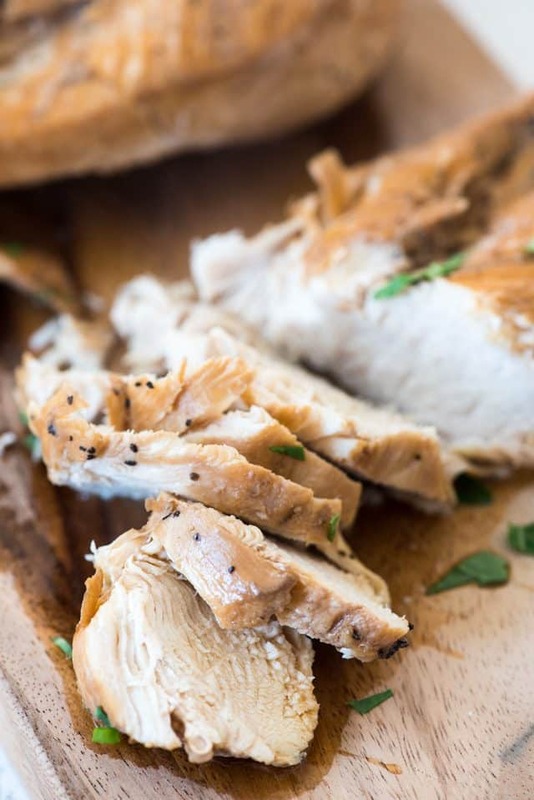 I’ve found that there are a few secrets to making the perfect Oven Baked Chicken Breasts and I’m going to share them with you! Using my easy tips for making Oven Baked Chicken Breasts will result in the perfect chicken every time. It’s flavorful and easy and perfect for meals all week long. We make about two pounds of chicken every weekend and then use it throughout the week. It’s so much better when you get it all cooked ahead of time! Even thickness of your chicken breasts. 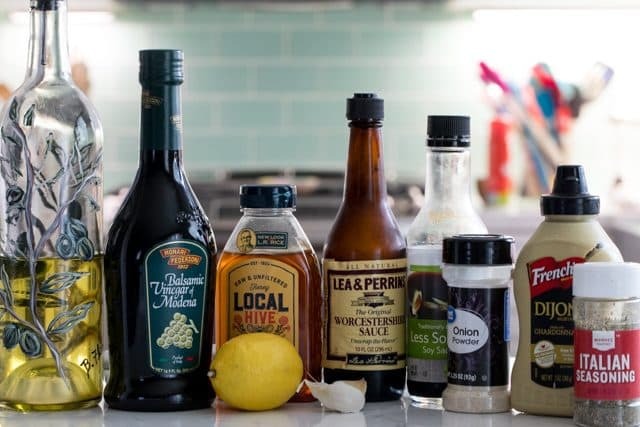 The perfect chicken marinade recipe. Let’s talk about each component. First, thickness of your chicken. Most of the time, chicken breasts are thicker at one end than the other. To combat this, I place them in a gallon size bag and pound them even with a rolling pin. The more uniform your chicken breasts are, the more evenly they’ll cook. Otherwise, they’ll be dry at one end and raw on the other. What’s the best chicken marinade recipe? I absolutely love this recipe and it’s a variation of the steak marinade I always use. I know, it has a lot of ingredients, but it tastes so much better than a store-bought marinade. In a pinch we buy 30-minute marinades, but I much prefer this one. Simply mix those together in a bowl or measuring cup. You don’t have to chop the garlic, just crack it a bit and you can leave it whole. Add your chicken breasts and let them marinate for at least 4 hours or up to overnight. Marinating time is important for your chicken! It helps the chicken absorb the flavor but also keeps it moist and tender. 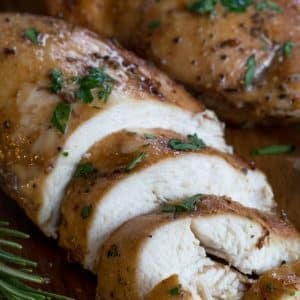 How do you cook chicken breasts in the oven? Once the chicken is done marinating, I add them to a baking dish I’ve sprayed with nonstick cooking spray. You’re going to bake them at 400°F until they’re cooked through, about 35-45 minutes. This is where an instant read thermometer comes in handy! They aren’t expensive and will ensure your chicken is cooked just perfectly without any guesswork. 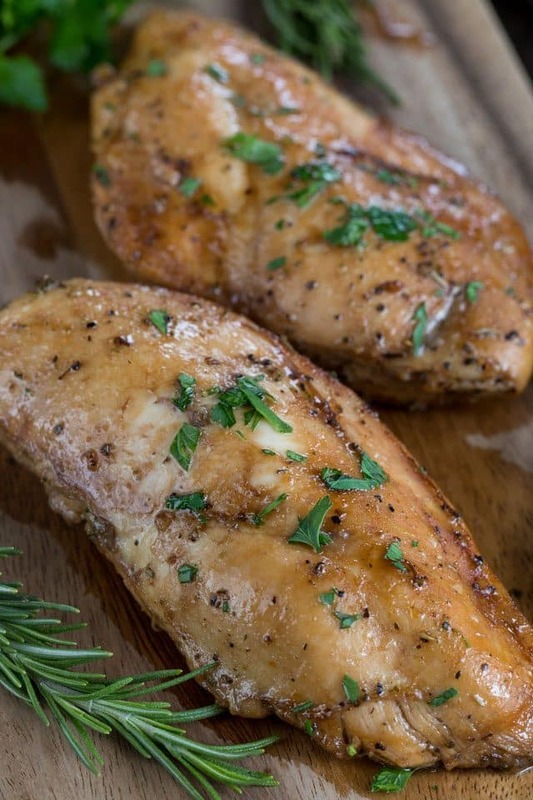 When are oven baked chicken breasts done? Your chicken breasts will be done when they reach an internal temperature of 165°F. That’s why it’s important to pound them to even thickness and have the thermometer! Once your chicken is done, let it rest about 10 minutes before slicing. 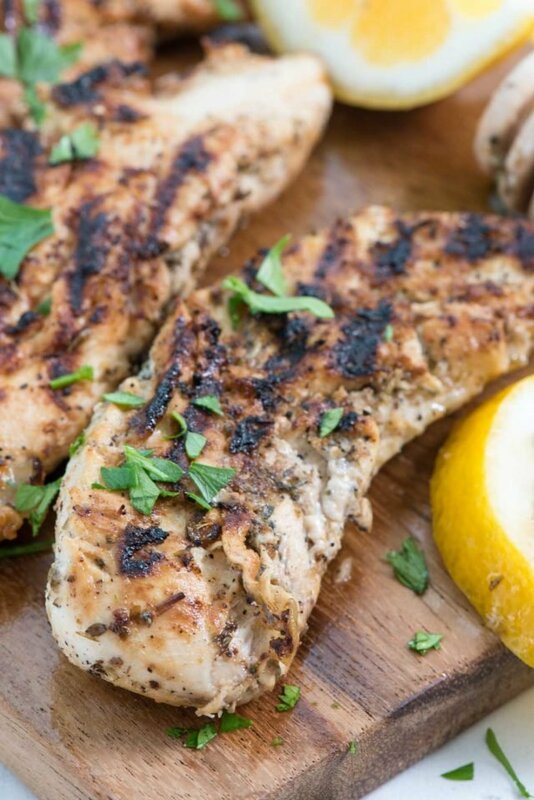 The flavor of the marinade adds so much to the chicken and it’s perfect with any side dish! 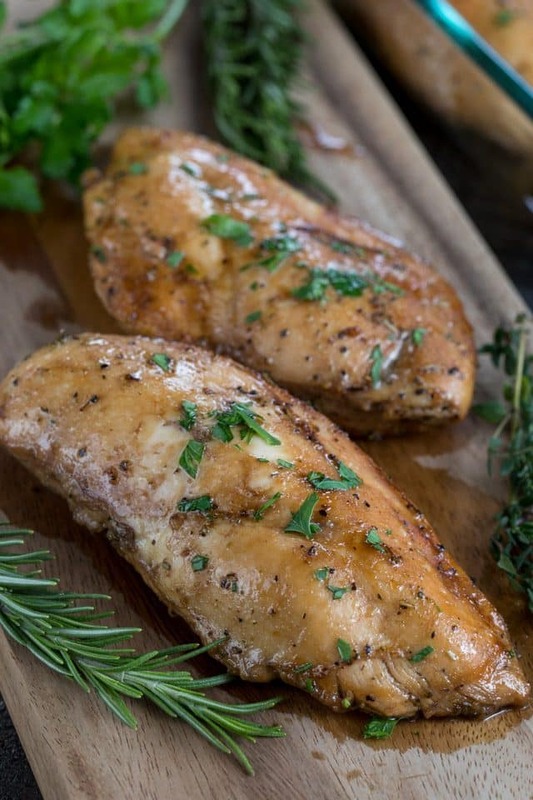 Make a large batch of these oven baked chicken breasts once a week and use them in recipes all week long! Want even more? Subscribe to Crazy for Crust to get new recipes and a newsletter delivered to your inbox. And stay in touch on Facebook, Pinterest, Twitter, and Instagram for all my latest updates. If you make this recipe, share a photo on social media tagging @crazyforcrust and using the hashtag #crazyforcrust. The best EASY Oven Baked Chicken with the best chicken marinade wit the perfect simple dinner recipe. Cook once and eat chicken recipes all week! 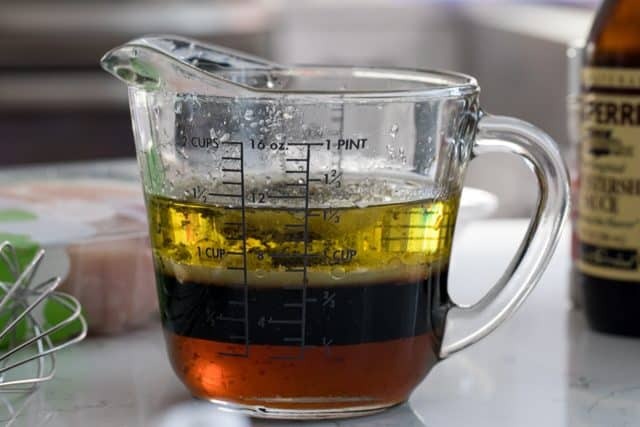 Whisk oil, vinegar, lemon juice, soy sauce, worcestershire, honey, dijon, Italian seasoning and pepper together. Add the garlic cloves. Place chicken in a large gallon size bag. Pound with a rolling pin to make the breasts even in thickness. Pour the marinade over the chicken, seal the bag, and let it sit in the refrigerator for at least 4 hours or overnight. Preheat oven to 400°F. 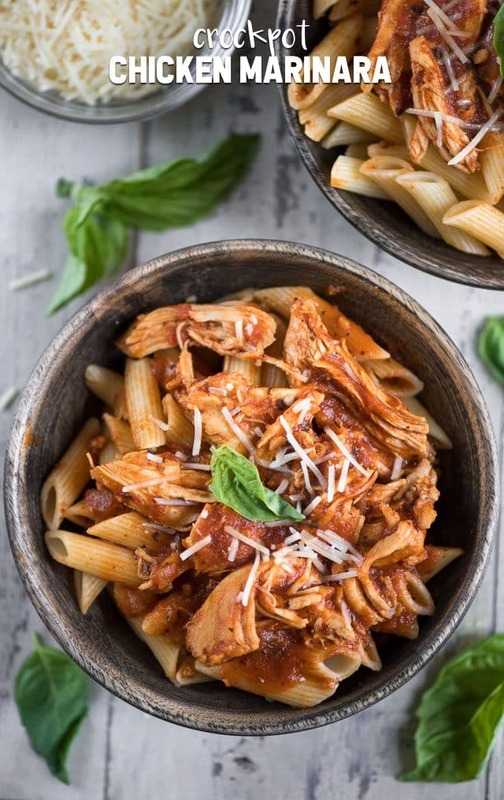 Take chicken out of the refrigerator and place in a baking pan sprayed with nonstick cooking spray (let it come to room temperature while the oven is preheating). Discard marinade. Bake for 35-45 minutes, or until a meat thermometer place in the thickest part of the breast registers 165°F. Cook time will depend on thickness of chicken. To grill: preheat grill to 400°F. Spray grill with nonstick grill spray. Grill 5 minutes per side with the grill open, then close the grill, watching to make sure it doesn’t get too hot or there are no flare ups, and cook until chicken registers 165°F on a meat thermometer. Let meat rest at least 10 minutes before slicing. I made this and It was so yummy!! Wonderful recipe. I never leave comments, but this recipe is beyond amazing. I found it on Pinterest and it’s the most delicious marinade in the world. And it’s really easy. I’m so glad I found it. I’ve prepared this two nights in a row. I love it.